Happy Monday! This is the beginning of a series of posts I’m planning to share on long distance relationships. 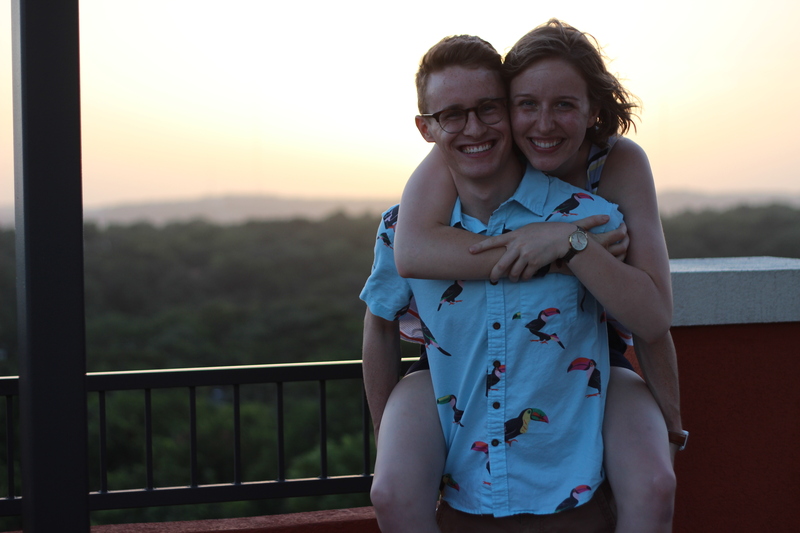 John and I started dating halfway through our senior year of high school and have been long distance (for us, MA -> TX) for almost two full years now. I remember panicking the summer before we left for school and google searching “Does long distance work?” (Hint: Don’t do this. It doesn’t help.) and couldn’t find much help. These posts will be directed at a college-aged crowd dealing with long distance, but could apply to a variety of people. I’m in Austin this week visiting John while he’s interning for the summer, so it seemed appropriate to start with the importance of visiting. Being in college is not the easiest time for most to have an extra $200-500 lying around to travel far and visit, but it’s important to make sure you put in the effort to keep your connection strong. Freshman year, based on our schedules and available funds, we found that we could manage two visits on top of seeing each other on a couple of breaks from school. I saw John about once every two months during this time. This past year, we were able to up it and I saw him about once a month, which will probably continue to be the trend for the next two years. While being so far apart has seemed to be a curse in many ways, I think it has been a blessing in some. If we lived closer together–say, if John were in NYC–we would probably visit too frequently and would both miss out on part of our own, independent college experiences because we were at the other’s university for such a large portion of our time. We’ve both been able to maintain our individual college lives and haven’t missed out on anything because of our relationship, which is something I made an effort to prioritize before we started. As I said, however, visiting is important and it’s key that you make the most out of visit. I’ve seen many diagrams that show three parts to relationships: mental, emotional, and physical. My theory on long distance is that your mental and emotional relationship grow stronger (I guess that’s a plus, haha), but you miss the physical component for most of the time. Making time to visit each other allows you to continue to mature as a couple in the physical side of your relationship. Lastly, for me, visiting is always a little bit of a struggle. It’s easier to go long distance when you start to forget the little things that you love about physically being with the other person, but visits bring all of those memories back all at once. The first time John visited me, I spent most of the visit crying because he was going to have to leave eventually. I’ve found that the best way to cope is to live in the moment and try not to dwell on the end date of the visit, but rather know that there is an end date to the long-distance portion of your relationship. Please let me know if there are any other long distance relationship topics you’d like me to cover or questions that you have! Until next time! I’m also in a super LDR and have been for about a year. It’s so tough; but it’s nice to know that we’re not the only ones 🙂 A lot of people just don’t quite understand how or why you would do it to yourselves–but you’re right, if you keep the big picture in mind, I think it’s an incredible gift to a relationship. We are SUCH better communicators, trustees and teammates from our distance. If you can do long distance, you can go the long haul! I couldn’t have said it better! I always feel a little judged like I’m crazy or lame for continuing to date my high school boyfriend, but I wouldn’t have it any other way!